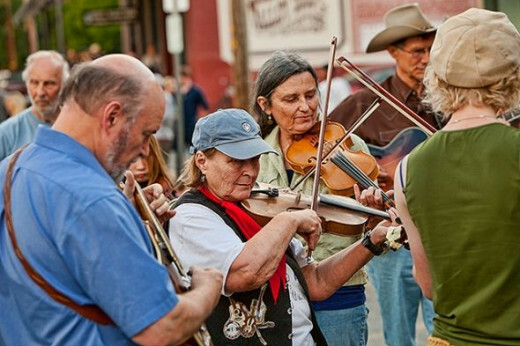 This article features the Scott Valley Bluegrass Festival. This festival ran for 10 years in a small town in northern California and, unfortunately, it has ended. A small number of dedicated business professionals did all the work to keep this event moving forward each year and nobody was found to take their place when they "retired" so the event has sadly passed into history. I will keep this article active as a memorial to the event and to portray a beautiful slice of rural Americana. 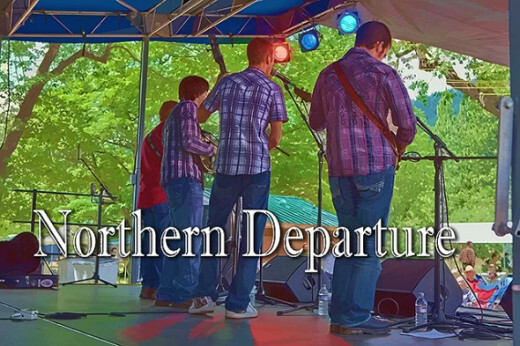 I will be featuring some of my bluegrass photography to give you a taste of the Scott Valley festival. I was not officially associated with the Scott Valley Bluegrass Festival but I became a fan and something like the unofficial photographer for the event. I gave the promoters my pictures to help promote the event and have even started making posters for them. I also made my photos available to the great bands that perform there. I was always amazed that they are able to pull such great bands into this largely undiscovered back country event. 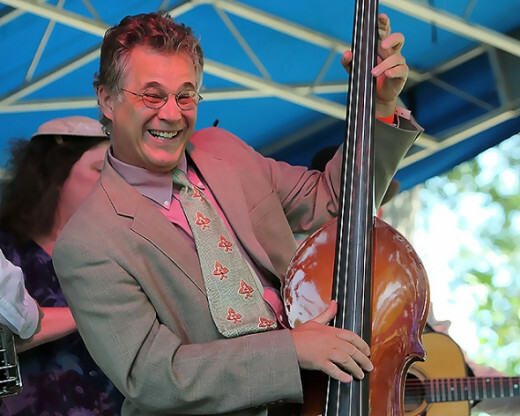 I have an entire gallery on my fine art website dedicated to bluegrass and it includes photographs of the event since I first attended in 2007. You will find that gallery here. If you play the sub-galleries as a slideshow you will hear some great background music. By the way, the festival was also a scholarship fundraiser for local high school students who want to further their education. Attendees not only had a great time but they were contributing to a great cause. Where In The World Is Scott Valley? That's a good question. Scott Valley is a valley in Siskiyou County in far northern California. 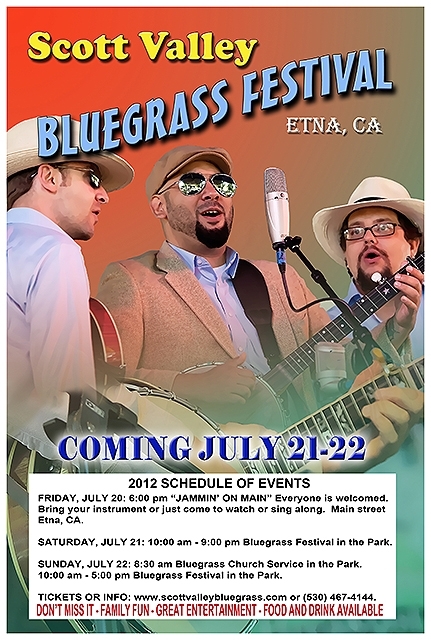 The bluegrass festival was in the town of Etna which is a slice of classic rural Americana (see photo on right). It's a town with a lot of history and a fun place to visit. In fact, all of Siskiyou County has a lot to offer with everything from shopping to hiking, camping, hunting, fishing, skiing, etc.. The county seat is a town called Yreka and that happens to be where I went to high school. It used to have a bakery which was called "Yreka Bakery" (of course) but it's a palindrome, that is if you spell it backwards, it's still "Yreka Bakery." If you had read my book, "Life at The End of a Dirt Road" you would already know this. I love palindromes, try this one, "A man a plan a canal Panama." Or how about, "Name no one man." "Madam, I'm Adam." But I digress, back to bluegrass. If you enter "Etna, CA" into Google maps or any map website you will find it with no problem. 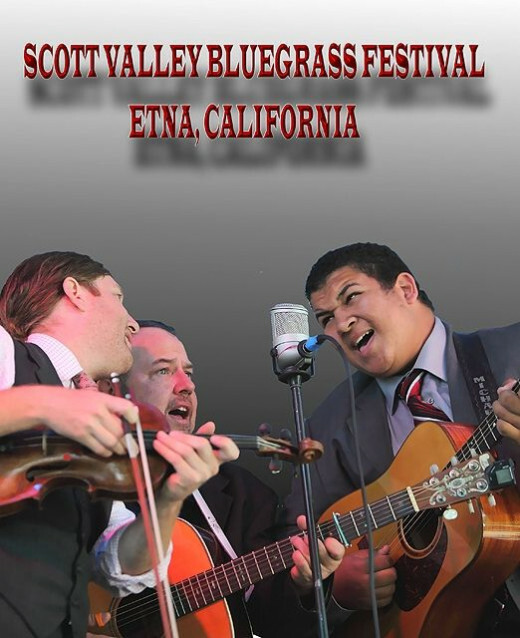 If you can find Etna, you can find the Scott Valley Bluegrass festival. 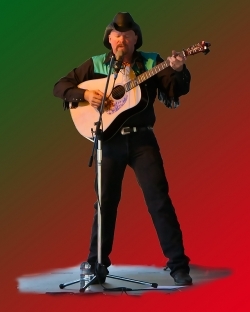 Amazon is a great place to buy your bluegrass music. Classical bluegrass with an Appalachian flavor. A great sampling of bluegrass classics. Vintage bluegrass in the Appalachian style. Explore the roots of bluegrass with some of the original artists. A fine sampling of some bluegrass favorites. 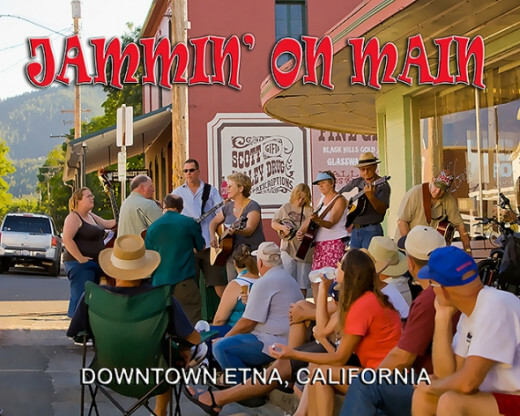 The festival itself was on Saturday and Sunday of the third weekend in July each year but if you came early could catch "Jammin' on Main" on Friday night. Main Street in downtown Etna was blocked off on the Friday evening before the festival and there was a wonderful bluegrass jam session. It started around 6:00 p.m. and people come from all over with their instruments or just to watch, sing along or listen. Often some of the professional band members would join in and everybody had a great time. Everyone was welcomed to play along or sing or just watch. The jammers tended to break into small groups that sang and played together surrounded by on-lookers who watched, danced or even joined in the singing. Everybody had a good time at Jammin' in Main. 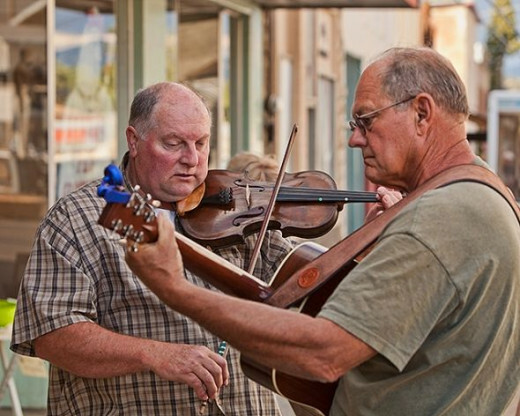 Following are some images of Jammin' on Main in downtown Etna on the eve of the bluegrass festival. This image ended up as part of an interesting local newspaper article. One of the fun things at the festival was the workshops. 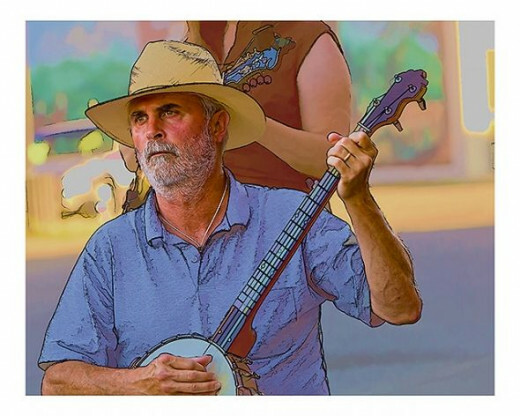 You could attend a workshop to have one of the professionals teach you to play a bluegrass instrument, it could be the guitar, banjo, mandolin, dobro or fiddle. It varied a little each year. 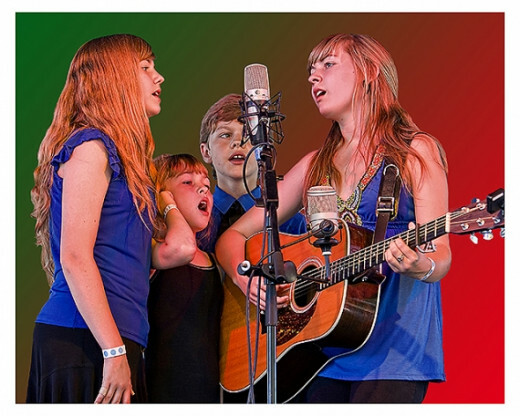 There were usually singing workshops where you could learn how to sing harmony parts or just improve your singing. 2013 Schedule - 10TH ANNUAL! 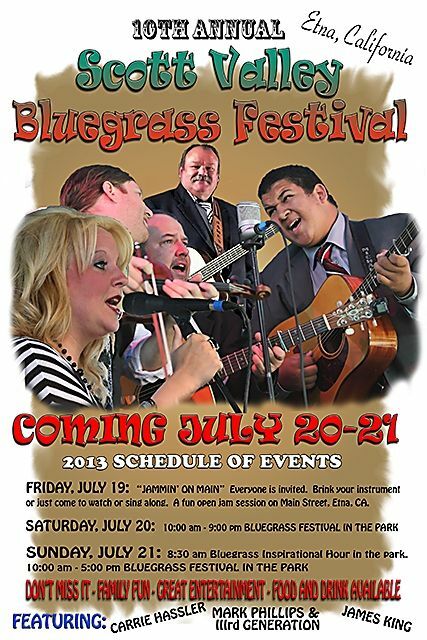 Here's the poster I made for the 2013 Scott Valley Bluegrass Festival. It was the 10th and final festival and there were some great bands there as usual. CLICK ON THE POSTER TO GO TO THE DOWNLOADABLE FULL RESOLUTION VERSION OF THIS POSTER. Somehow the festival committee managed to bring in great bands from around the nation every year. 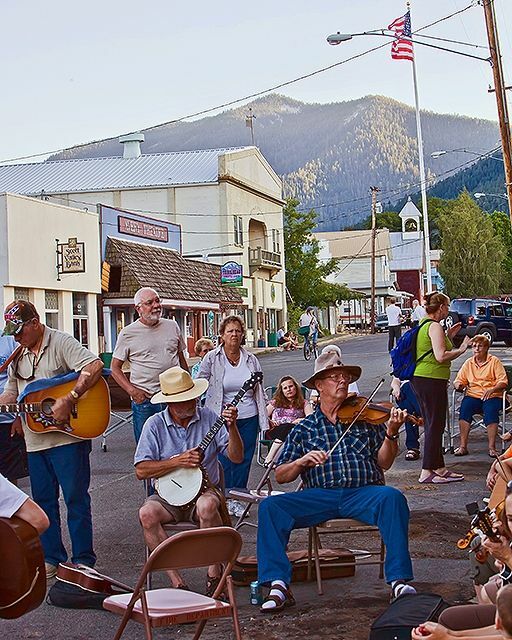 I considered the Scott Valley Bluegrass Festival to be one of the great "undiscovered" festivals. The festival was well attended but I say undiscovered because there was always room for more. Attendees usually came from northern California and Southern Oregon but some came from much farther. The setting was in a beautiful park and there was room for trailer or RV camping with additional lodging in town. The bands were varied and sometimes played a few tunes that weren't quite bluegrass but it was always a pleasure to hear professional musicians performing live. One year there was a bluegrass band (G2) from Sweden. If you haven't heard someone say "you all" with a Swedish accent you have missed some fun. 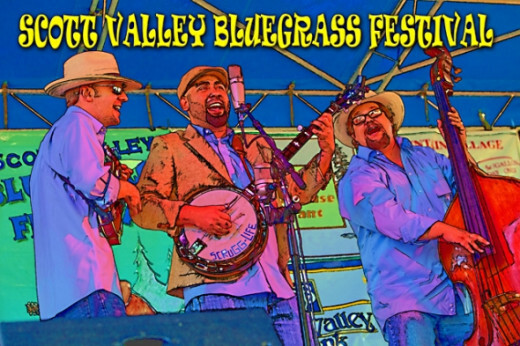 Following are some images of just a few of the recent bands at the Scott Valley Bluegrass Festival. I have a fine art photography website where you can view my diverse photographic interests. I have a gallery dedicated to giraffes, vintage vehicles and buildings, galleries for landscapes, waterfalls, birds, wildlife, painterly photography and a variety of other specialized subjects. Mount Shasta and various northern California scenes are prominent in many of my galleries. Most of the galleries have background music if you play them as a slideshow. This allows you to kick back and listen to the music as the images flow by. Whether you are looking for some interesting images or looking to purchase some photographic art, I think you will enjoy your visit to Chuck Nelson Photography. I also have a Zazzle website where you can purchase a wide variety of products featuring my digital art and photography. You will find it here. I have written a number of articles on a wide variety of subjects here on Squidoo. You will find information and links to all my Squidoo articles on my profile page here. This looks like a neat little town. Nice photos! @flicker lm: Thank you flicker...yes...it's a lovely thing. 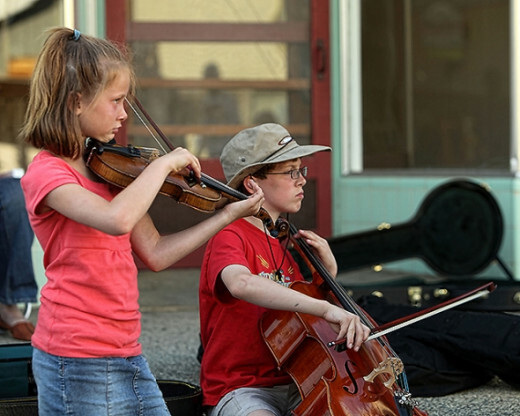 I loved all the photos, especially of the young folks making making music. @Rebeljohn: Thank you Rebeljohn...I loved your bluegrass lens! Great article i really enjoyed reading it. 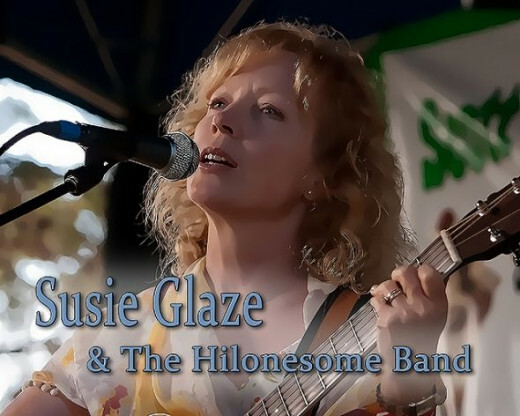 @casquid: Any friend of Patsy Cline is a friend of mine. Good job on the lens. There is always some good time for noodlin' on banjos every now and then. You may find this hard to believe, but I am a Patsy Cline fan for life! My second husband loved Bluegrass music. Never heard of this festival. I did spend 3 years in the Black Hills of South Dakota attending the Sturgis Rally Week (Harley Davidson). Plenty of Blue Grass there. You can say, I'm well rounded (no pun intended). @tebor79: Assuming a certain level of skill...I would agree. @PNWtravels: Thank you Vicki...it is an enjoyable experience. Nothing more pleasant to the ears than the sounds of a Banjo. 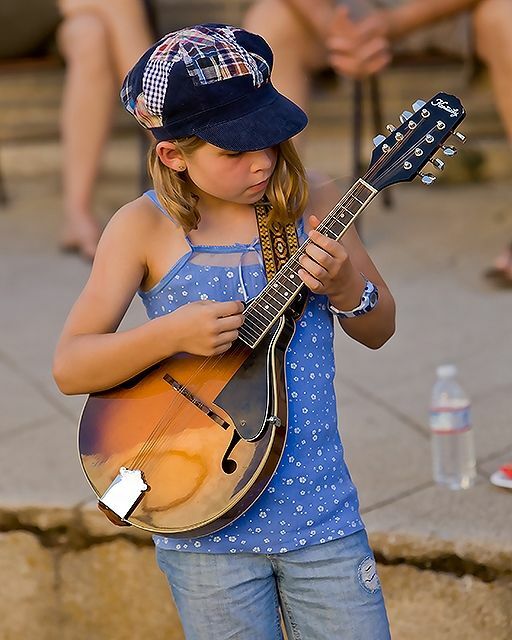 I enjoyed the great photos and the Scott Valley Bluegrass Festival sounds like a lot of fun. Congratulations on a well-deserved LOTD. @tricomanagement: Thanks...hope to see you there. Really great photos - great effects on some We will be going this year to listen to the music - see you there! @Johanna Eisler: You would love it! @norma-holt: Thank you so much...nothing like a squid blessing and digital hug to reward one's work. Looks like a lot of fun. I love small music festivals. I go to one myself each year and built a lens about it too. I will be in California in March and had originally planned to travel through that region, but am only going as far north as Lake Tahoe now. Congrats on LOTD. Beautiful lens with some great photos. Nice! Excellent photos and lens. Congratulations on your LOTD! @zav: Thank you zav...I've never seen a video of Jammin' on main. My camera will take video but without good audio I'll stick to stills. Good idea though. @anonymous: Thank you Dave....you would enjoy! Wow, what great images! This is such a good-looking lens. And it makes me want to attend the festival! Congrats on a well-deserved LOTD. I've attended this festival years ago and it was all fun! Although I am not actually a fan of country life, I can assure you that the festive spirit surely hit me and I liked it. For the great info I will give this lens 2 thumbs up! Congrats for being LOTD! CHEERS! Great lens. That looks like a lot of fun and great entertainment and on my birthday. I love that area of CA but I now live in Utah, bum! @fugeecat lm: Thank you fugeecat. You would enjoy the visit. The lady with the instrument on her lap is playing a dobro...it's a common bluegrass instrument and has a unique sounds. Your photos are wonderful. 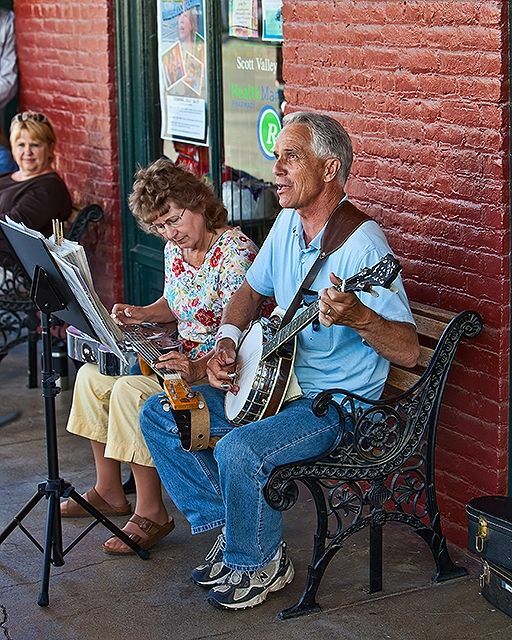 I really like the one with the man playing a banjo and the woman sitting next to him with an instrument in her lap. The festival sounds like loads of fun and if I'm going to put it on my places to visit. It looks like great fun! I wish I was there! Nice, fun t-shirts too. Well done, great lens. Really nice photos! Congrats on LotD! @Soulshine_Expressions: Thank you so much! @fotolady49 lm: Thank you Terri! Hey everybody, fotolady49 nominated me for this LOTD and she's really good at math, check out her equation above. @jimmyworldstar: There's quite a bit of bluegrass in CA. I didn't encounter it until after college but it's here to stay. 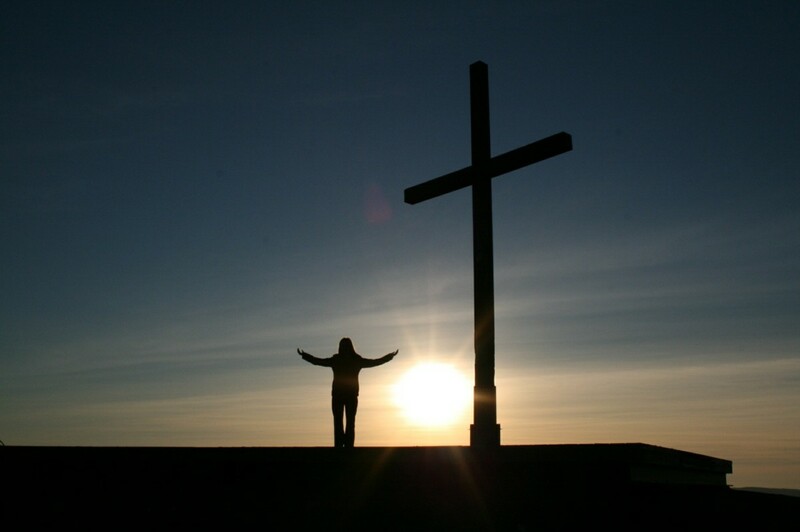 @CamelliaPenny: Thank you servantofthe Lord. 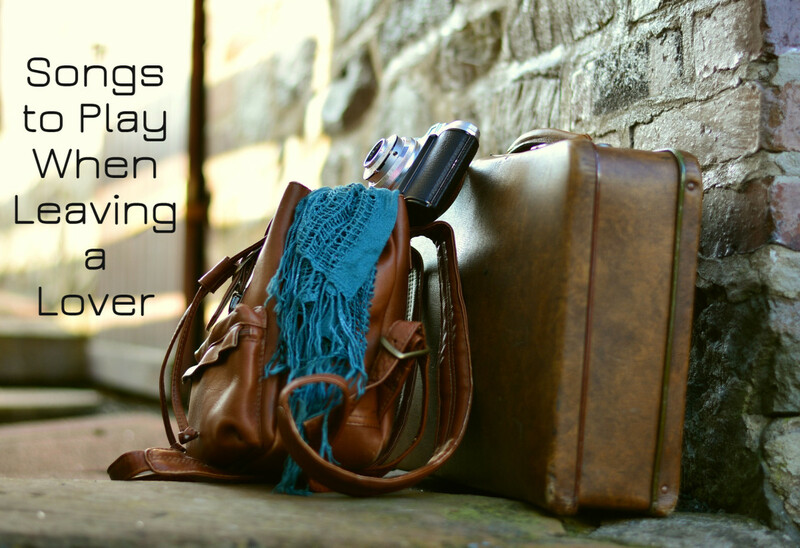 Hopefully you and your family can make the trip one day. @anonymous: Hi Beau...good to hear from you. It would be fun if you could come to the festival with me some year. @delia-delia: Thank you d-artist...I love your true story lenses. @joystickenvy lm: Thank you JSE. This is amazing job you done here. And i would like to say Congratulations on LOTD! Gorgeous photography! Congrats on LOTD! Wow I never would've expected to find bluegrass in California of all places. Looks like they have a good scene over there. Bluegrass music + photography = HEAVEN! 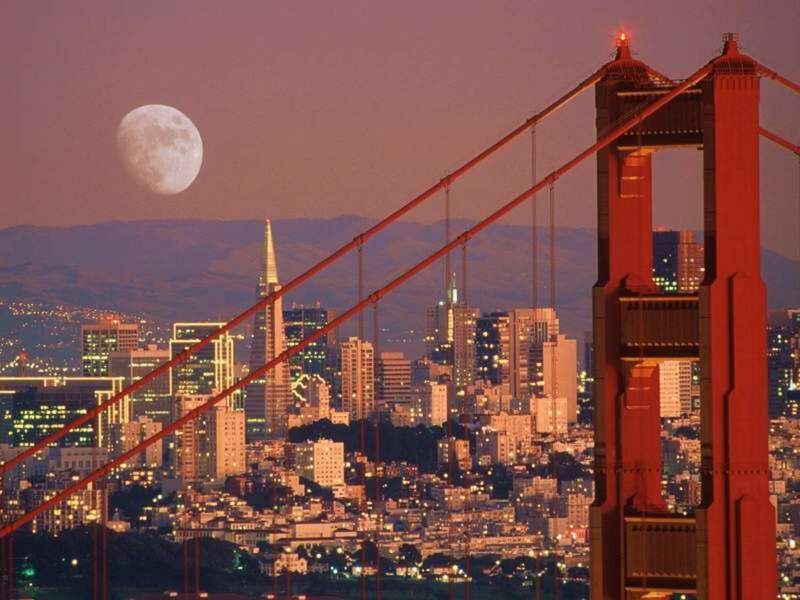 You make me wish I could travel to California . . . I love bluegrass! Great pics!! Even greater music!! Congratulations on LOTD! Great Lens! 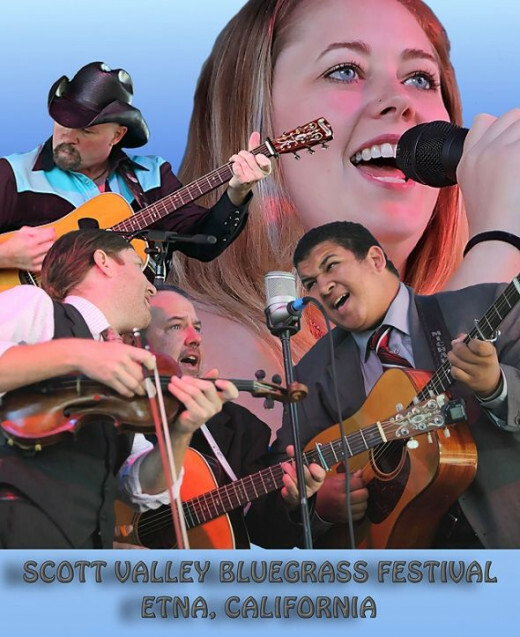 I have been to Scott Valley CA.but never to this event...however I have been to a few bluegrass festivals in Missouri. I love Bluegrass sounds! Great photos, too. Blessed. Congratulations on LOTD! Grats on your LOTD. 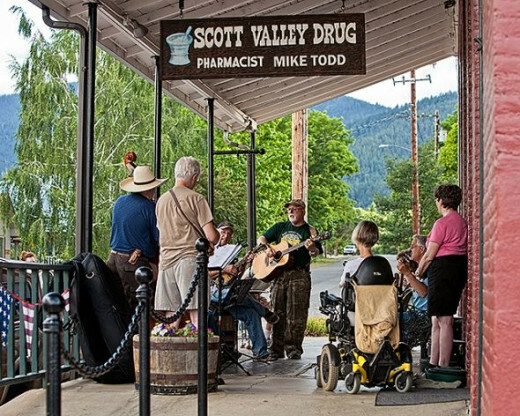 Scott Valley is too far for me to visit, but I used to attend several bluegrass festivals a year when I lived in NC. They're always a good time. This was really cool! Good job :)! I love music and photography myself. @kathysart: Thank you so much! @kathysart: Thank you Kathy...your art is wonderful. @agoofyidea: Thank you agoofyidea. 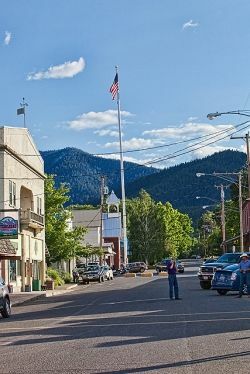 I grew up in the Shasta Valley...one valley to the east of Scott Valley but visited often. Ohh I forgot.. angel blessed! I love all the instruments! In Hawaii where I lived until recently, most of the children play the ukulele. You will often see them in the back of a pickup with one playing away. Some of the pics reminded me of that.. the ones with kids. It is a wonderful thing to pass on the beauty of making music. My father in law LOVED bluegrass and used to go to a fiddlers craft fair selling my pottery for me years ago. Lots of memories resurfaced with this lovely lens. Smile. @anonymous: Hey Tim...good to hear from you. Didn't we dig a coyote den one night? Congratulations on LOTD! This was a fun lens. I loved your pictures. I had friends in college who lived in Scott Valley. I think it would be a great event to visit. Blessed! @stacy mcdaniel: Thank you Stacy. @ScrollSawChuck: Thanks Chuck....you hit the G run and I'll chord behind you. @ViJuvenate: I'm glad you saw a bit of "home." 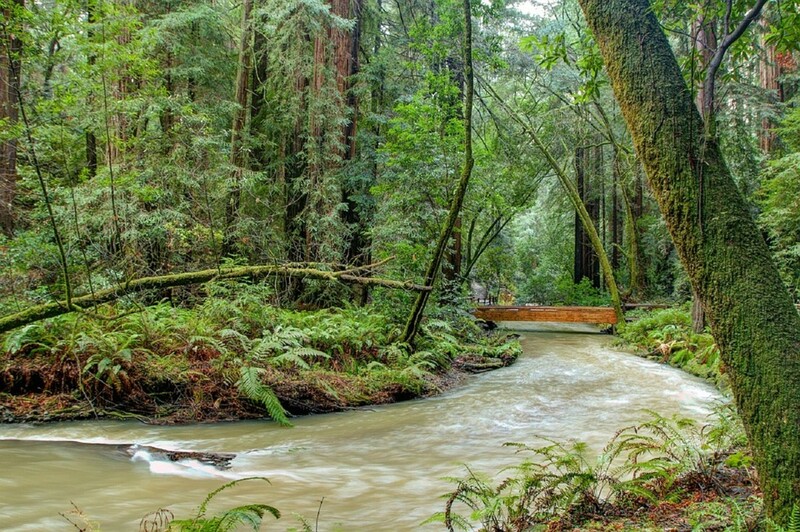 @Linda BookLady: Thank you Linda....come on up the river and visit the festival this July. My wife lived in Happy Camp so I can say my wife is a "Happy Camper"
Congrats on Lens of the Day. Great piece on Blue Grass &amp; Siskiyou County, I grew up in the area and attended school with Chuck from the 4th grade. Been away a long time and had no idea this festival existed. Wonderful images on this lens it captures the true joie de vie of a festival. Congratulations on getting Lens of the day. Outstanding! So glad to see this lens as Lens of the Day!